Given what happened in 2008, you might think we would have collectively learned our lessons about debt. We have not. 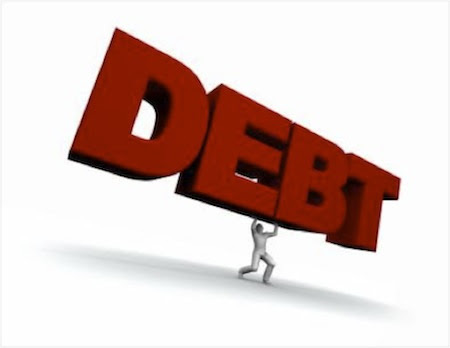 IPM Group : We have been writing about the extreme world debt loads and leverage build-up not only into 2008 but more importantly the increase in debt since then, which you can read here, here and also here. It has been reported we are facing a world debt crisis of over 220 Trillion (US$ equivalent) as of end of 2015 compared to a World GDP of just 77 Trillion. In fact since the debt bubble collapse and liquidity crisis of 2007 we have actually increased the world's debt by another 80 Trillion. Longtime readers know that one of my core beliefs is that massive debt levels have thrust us into a fundamentally imbalanced world. I believe our next great crisis, whenever it comes, will result from too much of the wrong kind of debt. Given what happened in 2008, you might think we would have collectively learned our lessons about debt. We have not. Like an alcoholic who wants to cure his affliction with another shot of whiskey, we seemingly have concluded that the way out of a debt crisis is to create more debt. At the end of 2007 the global stock of outstanding debt stood at $142 trillion. Then in 2008 the financial world fell apart. Everyone moaned and groaned about irresponsible lending to irresponsible borrowers. Never again, we said. I actually wrote that I expected to see the world deleverage. Boy, what an optimist. Less than seven years later, in mid-2014, we had added an additional $57 trillion in global debt, and the data this year is going to show that we’ve hit another record high. All the talk about deleveraging was only talk. We didn’t deleverage; we re-leveraged and then some. 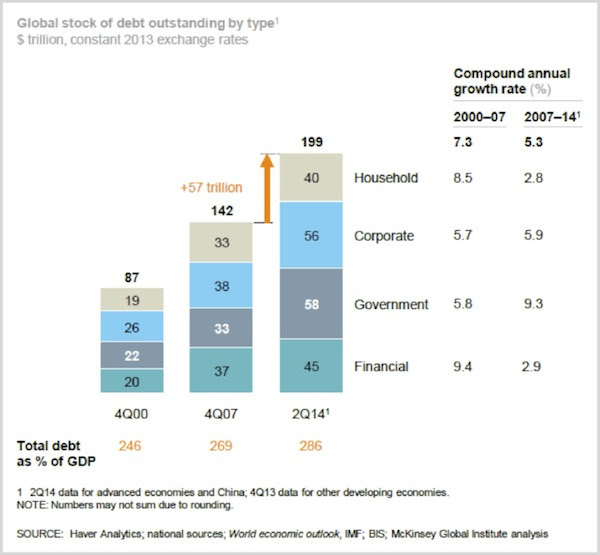 The chart above is from a February 2015 McKinsey Global Institute study called “Debt and (not much) deleveraging.” McKinsey is not an organization given to hyperbole, nor was it necessary in this case. Reality is bad enough. Does economic growth justify higher worldwide debt levels? Not unless you think the world’s economy grew at a 5.3% annualized rate from 2007–2014. Debt levels grew at that rate. GDP did not grow at that rate anywhere except (possibly) China, where debt growth was in the double digits. Debt as a percentage of GDP is even higher now than it was in 2007: 286% vs. 269%. Using 2007 as a baseline is misleading, too. We now know that debt levels that year were excessive by any measure. If we had too much debt then, we have way too much now. What has enabled such a debt-fueled boom? Low interest rates. US corporations have spent about $1 trillion over the last 12 months on share repurchases and dividends in order to sustain their stock prices. Much of this money was borrowed. Rather than working for an old-fashioned profit increase, businesses resorted to financial engineering. Who Are These Reckless Borrowers? I said above that total debt grew at a 5.3% annual rate from 2007–14. Some types of borrowers added debt faster than others did, according to the McKinsey data. Household debt grew 2.8% annually. Financial sector debt grew 2.9% annually. Corporate debt grew 5.9% annually. Government debt grew 9.3% annually. Banks and households missed their chance to deleverage – which means they will have trouble again in due course – but they at least kept their debt growth in roughly the same neighborhood as nominal GDP growth. Incidentally, notice that the pattern reverses if we go back further to the 2000–2007 period. Then, household and financial-sector debt grew much faster than corporate or government debt did. That suggests the next crisis won’t look like 2008. However it breaks down, we are now in an even bigger debt bubble than we were in 2008. We are going to pay for it and eventually deleverage, but the process will look different this time. Which is why everyone is so focused on when the Federal Reserve will finally raise rates. Several years ago, when I was writing Endgame with Jonathan Tepper, I had a fascinating conversation with Kenneth Rogoff and Carmen Reinhart. They wrote the seminal book This Time Is Different, cataloging more than 250 financial crises in 66 countries over 800 years, looking for differences and similarities. You can read some it transcribed in chapter 5 of Endgame. Among Reinhart and Rogoff’s findings is that it takes much longer to work off the excesses of a banking crisis than it does a typical business-cycle recession. The process can stretch out for years, with unemployment higher than normal and consumer demand sluggish the whole time. Sound familiar? REINHART: [We] are still highly, highly leveraged as a nation. And the same can be said for most other advanced economies. So what I am getting at to your question, John, is that I think we are in for a period of subpar growth. And in a period of subpar growth… [y]ou are not going to have the same kind of investment environment that we had in the run-ups to the IT bubble and in the run-ups to the subprime crisis. I think it’s going to be a different, more sobering environment. ROGOFF: Slow growth is here; that just comes with this debt no matter what way you turn…. Some countries won’t tighten their belts soon enough, won’t figure out how to do it.... But with the slow growth, whatever way you turn, you tighten your belt. Barring certainly a great, unbelievable period of technology growth or a friend from outer space helping us out, we do face slow growth, as Carmen said. I am not aware of any friends from outer space coming to help us out. If they arrive, I only hope they are more helpful than our friends from Washington, DC. The working-out process will not be easy. Reinhart and Rogoff said 4+ years ago that after a banking and credit crisis it is typical to have 10 years of slow growth. Elsewhere they talk about how economies in this situation often bump up against a kind of growth “ceiling.” That matches what we see in the US right now. Are we near the end of the process? I doubt it. If recovery from a banking crisis can take ten years and we are only seven years in, I expect (barring aliens) that we have a few more years to go. A few final thoughts: If we are entering a period of 1% or less growth – or God forbid, a recession – the Fed has few bullets left in its monetary policy gun. Can you actually take the world’s reserve currency to negative rates? Seriously? The only real weapon that the Fed thinks they have is another round of QE, but their own research has showed that quantitative easing wasn’t effective this last time. I have no idea what they think it would do next time, but they will feel they have to “do something.” Just for the record, I was talking with my good friend, interest-rate and Federal Reserve expert (he was a former Fed economist) Dr. Lacy Hunt, about what QE might look like the next time. I mentioned providing actual cash to individuals, and he let me know clearly that the Federal Reserve is by law not able to do that. At least the way we interpret the law today. They are also constrained as to the types of assets they can purchase. I suppose it’s possible that you could get Congress to agree to expand the range of assets the Fed can purchase, but that would require an amendment to the Federal Reserve Act, and no one in their right mind thinks that Congress will actually take that Act up for revision, as the debate would be so contentious as to be almost impossible to resolve. By the way, if the Fed initiates another round of QE, you can bet that other central banks around the world will double down and match. Try to get your head around another few trillion in various fiat currencies floating around in reserve accounts. Gold, anyone? Just saying… Right now there is little love for the barbarous yellow relic, but that could change. Stay tuned.